One of my personally treasured Christmas time activities is Christmas movie night. You get to sit on the couch watching a classic movie, hopefully next to a fire while wearing a onesie, and stuff your face with delicious Christmas snacks. 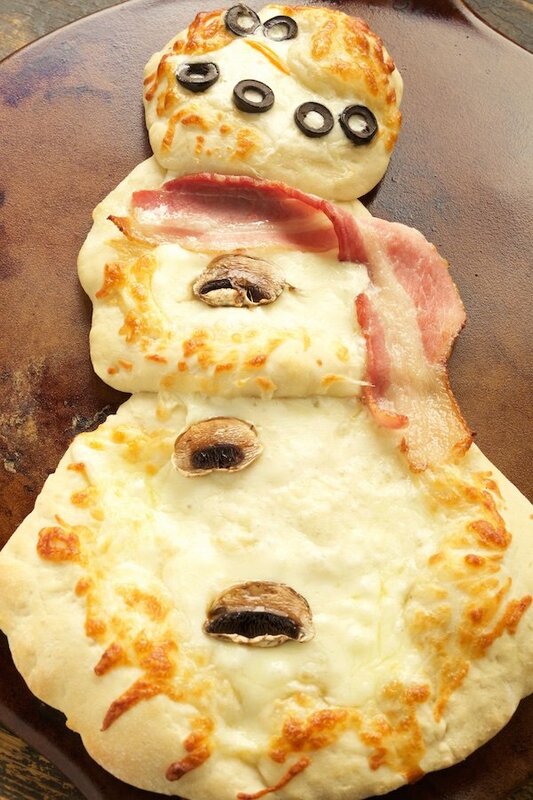 This year, Janette and I decided to make Snowman Pizzas. I’m not the biggest fan of red sauce, so we used Janette’s favorite sauce, ranch, as our base. It goes perfectly with the bacon and mushrooms. If you want to make an all veggie pizza, simply use red and green bell pepper for the scarf and omit the bacon. We used our homemade pizza dough (included in the recipe below), but if you are pressed for time or don’t have a stand mixer, just use pre-made. Pillsbury’s canned pizza dough would work well. Here’s to a tasty snowman and a merry Christmas movie night! In a the bowl of a stand mixer, combine the water, yeast, sugar, salt, and olive oil. Let sit for 10 min. Pat or roll out the dough on a well-floured surface into about into 3 rounds (6 if you are making two pizzas) of different sizes for the snowman’s body. Place on pizza stone. Top with ranch dressing. Spread on snowman’s body leaving room around the edges for crust. Top with shredded mozzarella. 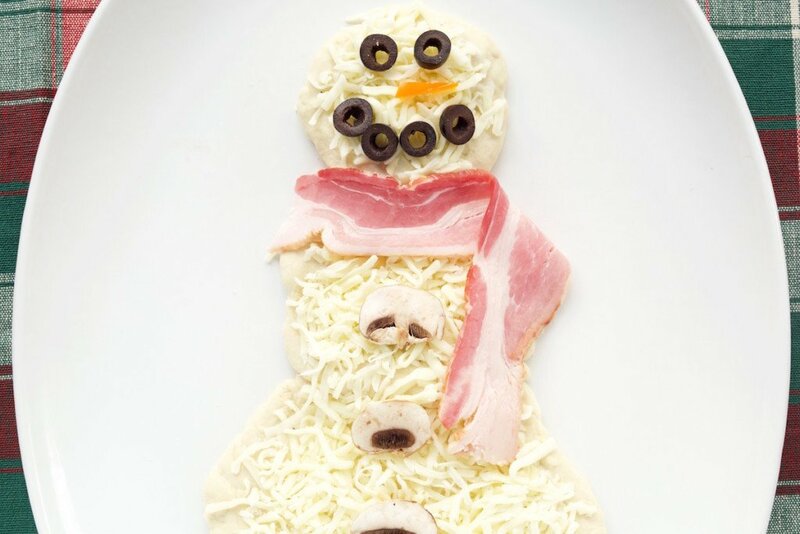 Place bacon for the scarf, olives for the eyes, mushrooms for the buttons, and the orange bell pepper for the nose and watch your snowman come to life! When oven is preheated, place pizza stone inside and cook for 10-15 minutes, until crust is a golden brown and cheese is melted. 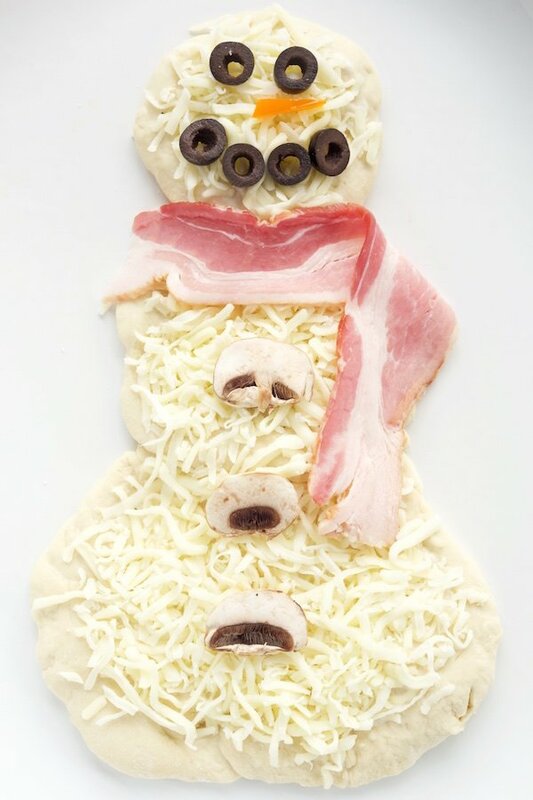 Turn on your movies, slice that snowman pizza, and enjoy the holidays!